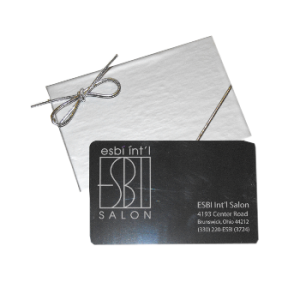 All Gift Cards come in a beautiful box and can be picked up at the salon or shipped via Standard USPS or rushed by UPS to the address you provide below. You will be able to choose any amount ranging from $25 to $200 through our website. 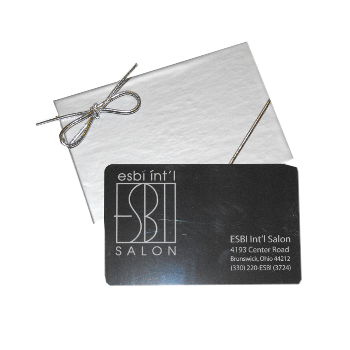 If you require a gift card of a different amount or if you have any questions, please call us at 330-220-ESBI (3724) or just stop by during our normal business hours. Click SUBMIT to go to Step 2: Choose your Gift Amount!